Acapela Group » Traveler assistance experience test at Narita Airport: Acapela gives an English voice to Kokoro lifelike android robot to guide and inform passengers. 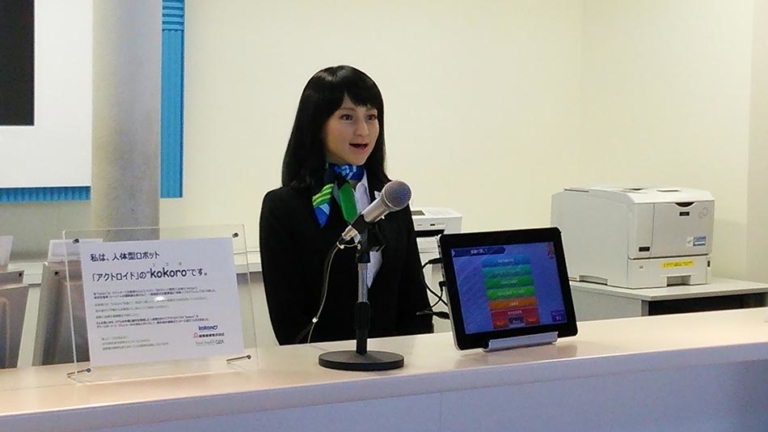 Traveler assistance experience test at Narita Airport: Acapela gives an English voice to Kokoro lifelike android robot to guide and inform passengers. Acapela Group and AI are partnering to give a voice to Kyoei Sangyo’s humanoid assistance test held at Narita airport. Sharon, the US English synthetic voice developed by Acapela Group, the speech solutions expert, has been selected by the Japanese company AI, and provided to Kyoei Sangyo, to give the say to Kokoro, a humanoid robot. Sharon will be used with AI’s text to speech voice for a demonstration experiment starting February 28th 2017 at Narita Airport. Kokoro will be the first robot in Japan to provide assistance at an Airport insurance counter. It is speaking Japanese and English, using AITalk® by AI, Inc. for the Japanese and Acapela TTS for the English voice. The humanoid will guide passengers on their way in Terminal 1 and inform them about overseas insurance procedures and registration, important notices, medical and health information and will also provide them accurate information about their flight and departure gate through an innovative and unexpectedly engaging way. Kokoro looks very human, moves its head, bows, blinks and talks with a highly natural voice and can engage in a conversation. Kokoro will welcome, inform and guide passengers from February 28th 2017 to May 8th 2017 in front of GPA overseas insurance counter in Narita Airport terminal 1, south wing, 4th floor, departure lobby. Don’t miss the opportunity to meet her at Narita airport!